Load Index. The Load Index is a numerical code associated with the maximum load a tyre can carry at the speed indicated by its Speed Symbol under service conditions specified by the tyre manufacturer. Speed Symbol. 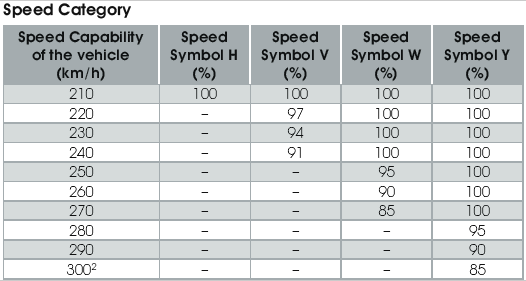 The Speed Symbol indicates the speed at which the tyre can carry a load corresponding to its Load Index (except for speeds above 210 km/h, see table of load capacity versus speed below) under service conditions specified by the tyre manufacturer. Speed Category. The Speed Category markings shown below indicate tyre speed capabilities above 240 km/h and are included within the tyre size designation e.g. 225/50 ZR 16. Generally, Service Description is not shown on such tyres. For actual speed capabilities and load capacities, consult the tyre manufacturer concerned. Tyres for speeds over 240 km/h may be marked for an interim period with both ‘ZR’ and the relevant service description (e.g. 195/50 ZR 15 82W, 195/50 ZR 15 82Y) to specify the tyre performances; in the absence of service description, consult the tyre manufacturer for actual maximum speed and the relevant load capacity. All speeds shown in the tables apply to tyres when in good condition, inflated to the correct pressure, operating within their specific load capacity and fitted to a correct size rim. Speeds quoted are the maximum speed of which the car is capable, not the speed at which it is normally driven. Percentage of Load Capacity (%) versus Speed. For ZR Tyres, where no Service Description is shown, the Maximum Load capacity shown in the Tables applies; the actual speed capabilities, load capacities and the relevant inflation pressures will be agreed between vehicle and tyre manufacturers (or their national associations) taking into consideration the vehicle characteristics and the type of service. In the absence of such an agreement, it is recommended that for speed capabilities between 240 and 270 km/h, the load capacities and relevant inflation pressures of ZR tyres be the same as for tyres with ‘W’ speed symbol, up to the maximum speed certified by the tyre manufacturer. 1 For intermediate maximum speeds, linear interpolation of the tyre load capacity is permitted. 2 For speed capabilities over 300 km/h, the percentage of the load capacities and the relevant inflation pressures will be agreed between vehicle and tyre manufacturers (or their national associations) taking into consideration the vehicle characteristics and the type of service. Tyre pressures must be checked at least monthly. You'll find the right tyre pressures for your car in the handbook. If you can't, or have lost the handbook, ask your local Avon dealer to look them up for you. If you're checking the pressures yourself, try to use a digital tyre pressure gauge - they're not expensive but they are more accurate than the gauge on most garage forecourts. It's important to check the pressures when your tyres are cold, so wait for about an hour from when you last drove on them. Another thing to remember is that if you're driving at constant high speeds or are carrying a heavy load, the pressures can be different - again, consult your car's handbook or ask your Avon dealer for advice. Under or over-inflated tyres can seriously affect your car's handling, ride and braking behaviour and could lead to an accident. In other words, it pays to get the pressures right. It's worth noting that you can't tell just by looking, so always use a gauge. Also remember that a wrongly inflated tyre will wear out quicker, which will leave a nasty feeling in your wallet.